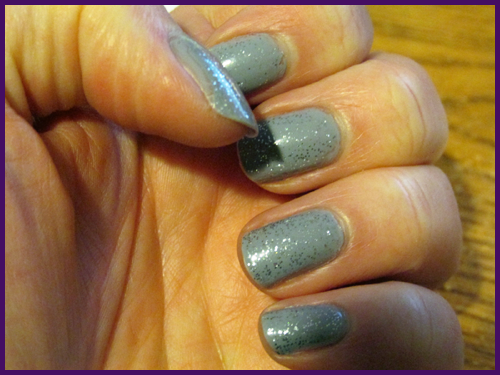 Note: I applied this polish on December 8th and took the photos on the 13th. These photos were taken with my camera (usually I use my phone). Oops on me for forgetting to take a photo of this beautiful mani until the day it started chipping!! Seriously no chips until yesterday and I thought, oh darn it, I never put it on my nail blog or had taken a photo. Eep. Anyways, the base color is Carey (Zoya). I used one coat and the dry time was pretty quick. Had I been wearing it on its own, I would have done two coats to get full coverage. 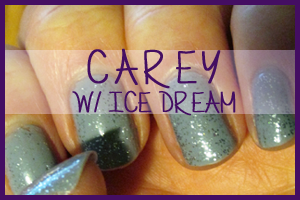 The blue/gray creme color is one of my favorites and it is great for layering with glitters. The glitter I used was Ice Dream (Sinful Colors). The main idea behind this mani was because I wanted to use this glitter. I changed my mind 6 times for the base color (not even joking, lol). It is beautiful and works for any color. It has blue and silver tiny sparkles in it that just seem to just add so much beauty to the base coat. It is easily my favorite glitter that I own. I used one coat. 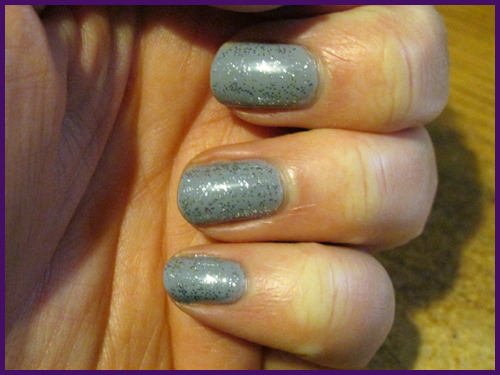 Dry time for both polishes were pretty quick and I had no smudges during the dry time. Very simple and quick mani that looks pretty. It may or may not have been slightly inspired by Frozen which I just watched for the first time recently (don't get the hype but it was cute). Overall I am giving this mani 6 out of 6 stars!! Great colors + good dry time + easy application = happy me.